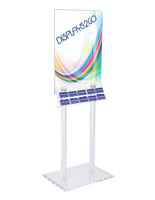 This acrylic poster stand rises to a height of 67" and holds (2) 22"w x 28"h graphics for double sided viewing. 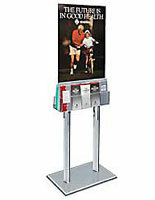 The floor display moves freely on (4) locking casters for easy mobility. 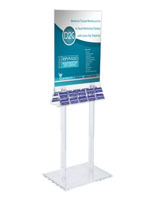 The poster stand is manufactured from clear acrylic plastic with machine-polished edges. 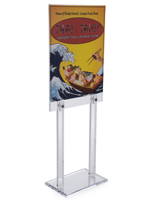 This makes the acrylic really sparkle and would look great in any upscale environment. 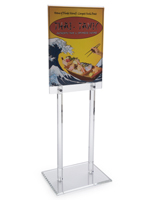 Our poster stand displays your graphics sandwiched between two acrylic plates for double-sided viewing. Ships flat with (easy) assembly required.